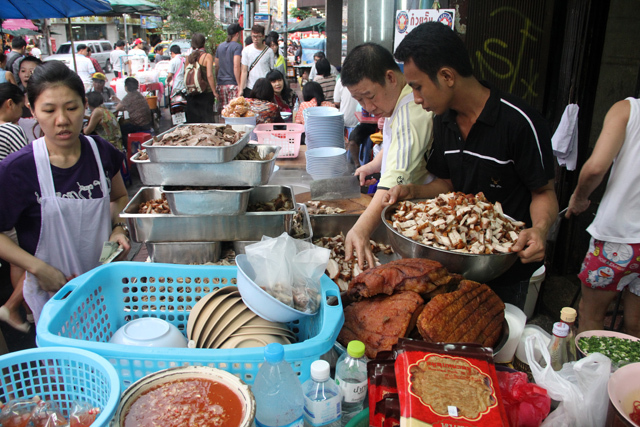 Yaowarat, Bangkok’s Chinatown, is one of the most famous areas of cuisine in town. 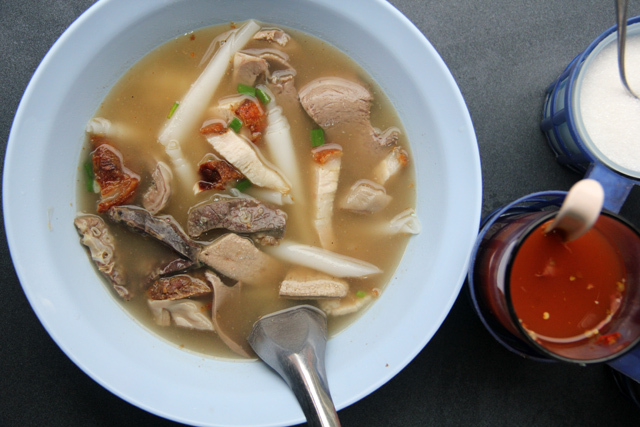 While bird’s nest soup and Thai Chinese fare (served at places like T & K Seafood) are popular, it’s a porky noodle dish by the name of kuay jab nam sai (ก๋วยจั๊บน้ำใส) that is one of the dominating dishes on the streets. 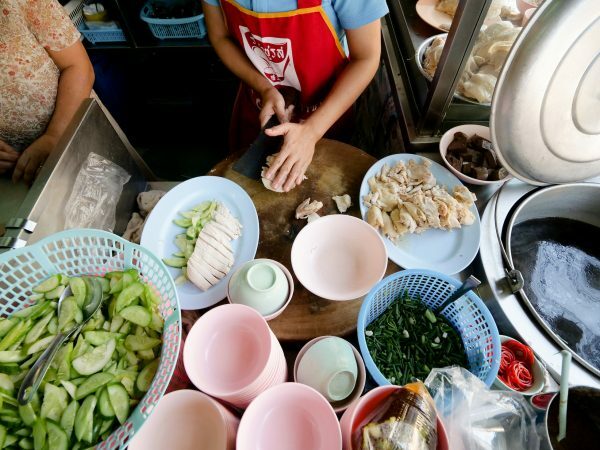 There are a number of stalls that sprout up each evening along Yaowarat Road serving this street food delicacy – and a great one happens to be just outside a former movie theater. It is at Kuay Jab Uan Pochana (ก๋วยจั๊บ อ้วนโภชนา) that noodle rolls are never ending and a small army of pigs are served each night. Customers, mostly locals, flock to get a bowl of the rich good stuff and after licking their bowls clean, many get a few orders to-go. 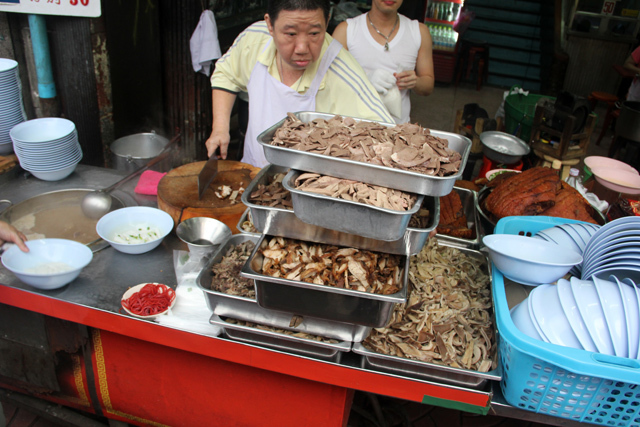 It’s immediately evident that the knife carrying man who divvies out the pork parts for each bowl of kuay jab noodles has a deep relationship with the pig. I recommend ordering the normal version of kuay jab nam sai (ก๋วยจั๊บน้ำใส), a hearty bowl that includes rice noodle rolls, a wonderful mixture of delicate pig parts, crispy pork belly, and a murky offal brewed broth of pure piggy delight. Lungs, heart, liver, intestines and possibly other things were all swimming in my bowl. The broth was a peppery blend that just needed a little extra chili and vinegar to make things perfect. If you’re not so much into pig innards, you can ask for a bowl that only includes crispy pork belly – but let me assure you, this is not a vegetarian friendly eatery. 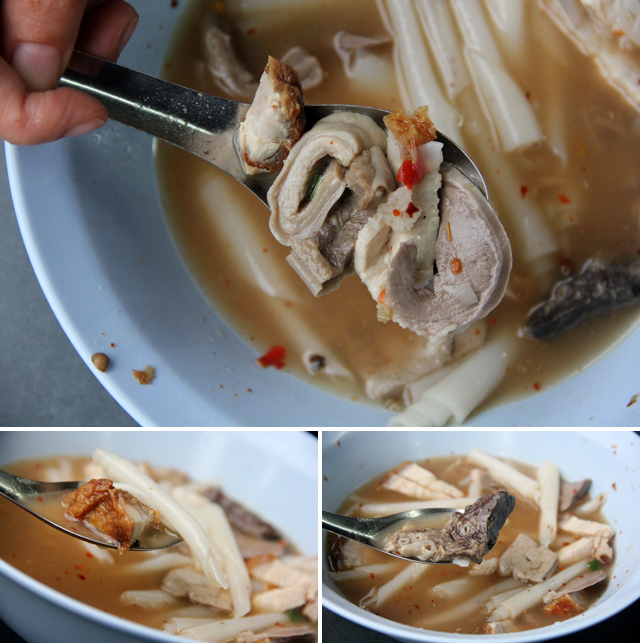 Kuay Jab Nam Sai (ก๋วยจั๊บน้ำใส) – The wonderful parts of a pig, all in one bite! 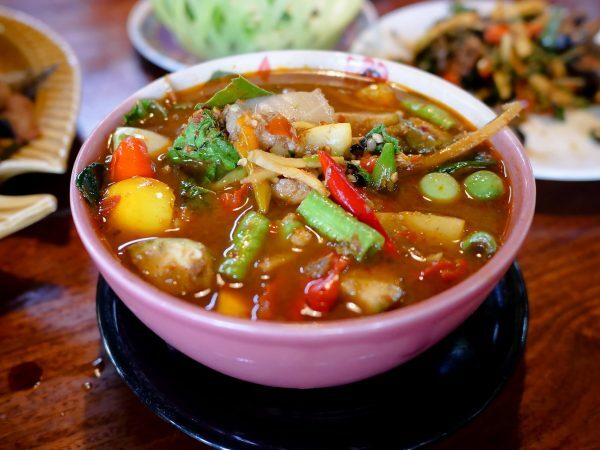 If you love pork, and don’t mind the inner organs (which happen to be extremely flavorful if you try them), you’ll have a party in your mouth with this bowl of kuay jab nam sai (ก๋วยจั๊บน้ำใส)! 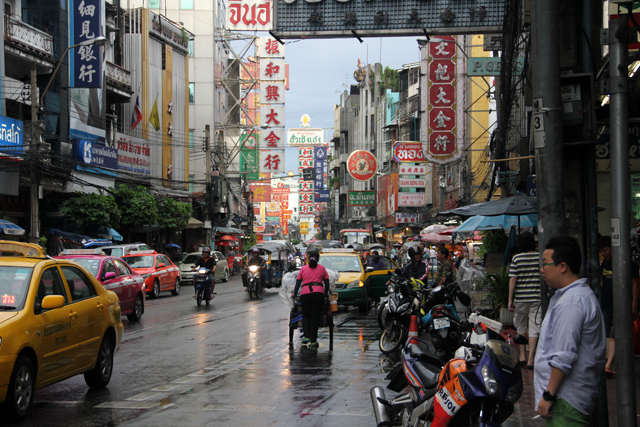 Here’s a Chinatown Bangkok video, where you’ll be able to see this kuay jab in full porky production! The kuay jab at Kuay Jab Uan Pochana (ก๋วยจั๊บ อ้วนโภชนา) is absolutely masterful, you won’t regret eating it. The richness of the pig parts blend is irresistible. 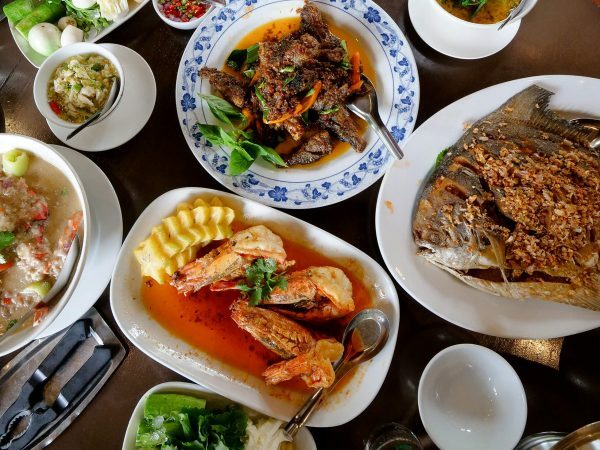 It’s located in the heart of Yaowarat Chinatown on Yaowarat Road in between Soi 9 and Thanon Yaowa Phanit. The easiest way to get there is probably by taxi, but you can also take the MRT to Hua Lamphong station and it’s about a 10 minute walk into Chinatown from there. Hi Kenneth, thank you very much, really appreciate it. I’m not looking forward to that, but I do know that I’ll need to as well. Thank you for your support! Hi Mark! Awesome site! Will start backreading. OMG – you and your love of chili! haha I can still remember you telling me how they just make everything amazing! Thailand suits you really well! Hey Catherine, thank you very much. Haha, yes I’ve been addicted to chili for a long time. Hope you and your family have an amazing visit. Awesome. That kills two birds with one stone. Some offally goodness and real Chinese food not that Americanized garbage we get here in the States that hardly differs from one restaurant to the other? 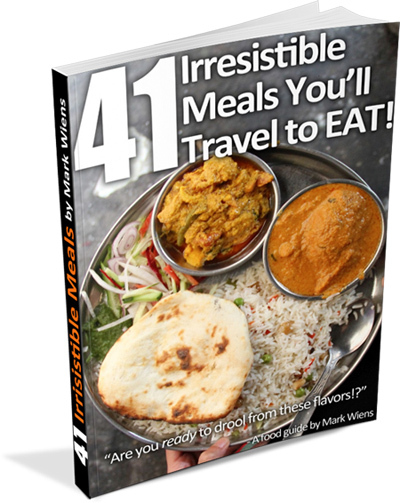 Yes – and it’s so good!